Learn from experts in the fields of neurology, neurosurgery, and other aligned disciplines by viewing sessions from various conferences we have hosted, co-hosted, or helped organize. Please take a moment to subscribe to our You Tube channel here so you are notified of new videos as soon as we upload them. 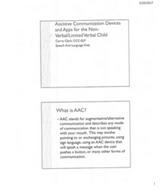 Did you know that the Individuals with Disabilities Education Act outlines the steps to building your child’s IEP? Before you walk into an Individual Education Plan (IEP) meeting, you MUST understand the steps! Monika Jones, JD, our CEO and member of the board of directors of the Council of Parent Attorney Advocates, shares how to build your child’s IEP at the 2018 meeting of the National Organization of Disorders of the Corpus Callosum. Why are the sounds of language more important than identifying letters when a child is learning to read? What is our knowledge base about struggling readers, including hemispherectomy? What reading assessments are appropriate after epilepsy surgery? Joanna A. Christodoulou, EdD, MIT researcher, discusses how we learn to read and the impact of hemispherectomy and other resection surgeries at the 2017 Pediatric Epilepsy Surgery Conference and Family Reunion. Dr. Gary Mathern discusses differences in hemispherectomy procedures, types of procedures and seizure recurrence, and differences in underlying conditions (etiologies) at the 2011 International Hemispherectomy Conference and Family Reunion sponsored by the Hemispherectomy Foundation. Dr. Ki Hyeong Lee Medical Director of the Comprehensive Pediatric Epilepsy Center at the Florida Hospital for Children in Orlando, Florida, discusses the challenges of reading EEGs after hemispherectomy surgery at the 2017 Pediatric Epilepsy Surgery Conference and Family Reunion. Dr. Aria Fallah, a fellowship trained pediatric neurosurgeon who practices at UCLA Mattel Children’s Hospital and Ronald Reagan UCLA Medical Center and Assistant Professor of Neurosurgery and Pediatrics at the David Geffen School of Medicine at UCLA, discusses hydrocephalus after hemispherectomy and other procedures at the 2017 Pediatric Epilepsy Surgery Conference and Family Reunion. Some areas of the brain are difficult to disconnect. Dr. James Baumgartner, Surgical Director, Epilepsy, at the Florida Hospital for Children, discusses which brain conditions make it difficult to secure complete disconnection, how to determine if there are missed connections if seizures return after initial disconnective/resective surgery, the use of diffusion tensor imaging to map missed connections and its reliability, at the 2017 Pediatric Epilepsy Surgery Conference and Family Reunion. Hemiparesis can cause significant lower extremity musculoskeletal issues, often requiring surgery. This session by Dr. Raymond Woo, Medical Director of Pediatric Orthopedics at the Florida Hospital for Children from the 2017 Pediatric Epilepsy Surgery Conference and Family Reunion, addresses the various surgeries to correct hip subluxation, drop foot, and other issues. Kevin Pratt, OD, CST, discusses splinting and other interventions for upper extremity weakness after hemispherectomy at the 2016 Hemispherectomy Conference and Family Reunion. Phil Zeitler, MD, PhD, Professor, Pediatrics-Endocrinology, Section Head – Endocrinology, Medical Director – Children’s Hospital Colorado Clinical & Translational Research Center, discusses central endocrine issues in some children with neurological challenges, including after hemispherectomy surgery and/or hydrocephalus. These challenges include central diabetes insipidus, early puberty, weight gain related to thyroid dysfunction, and other challenges. Dr. Christopher Oakley, assistant professor of neurology at the Johns Hopkins Institute, discusses headaches and fatigue after hemispherectomy surgery at the 2015 Hemispherectomy Conference And Family Reunion. Dr. Cynthia Salorio, Ph.D., assistant professor of physical medicine and rehabilitation at the Johns Hopkins Institute, discusses executive functioning and processing after hemispheretomy at the 2015 Hemispherectomy Conference and Family Reunion. Robert W. Enzenauer, MD, MPH, MSS, MBA, Chief o Pediatric Opthalmology at Children’s Hospital Colorado and Lynn Hellerstein, OD, Hellerstein Resources for Creative Learning, discuss visual challenges after hemispherectomy at the 2016 Hemispherectomy Conference and Family Reunion. Dr. Frank Musiek, PhD, CCC-A, and Director of the University of Arizona’s NeuroAudiology Lab discusses how hemispherectomy surgery affects the brain’s ability to process sounds and words at the 2016 Hemispherectomy Conference and Family Reunion. Michael Kirkwood, PhD, MA, Associate Clinical Professor, Physical Medicine & Rehabilitation, Director, CHCO Rehabilitation Psychology / Neuropsychology and Co-Director, CHCO Concussion Program, discusses the finer points of neuropsychological assessments after hemispherectomy, including comparisons to and limitations of school psycho-educational assessments at the 2016 Hemispherectomy Conference and Family Reunion. Dr. George Jallo discusses hemispherectomy and other disconnection techniques at the 2015 Hemispherectomy Conference and Family Reunion. W. Donald Shields, M.D., Emeritus Professor of Neurology and Pediatrics, David Geffen School of Medicine at the University of California at Los Angeles, discusses infantile spasms, hemispherectomy, as well as the underlying etiologies that often require removing half the brain to stop catastrophic epilepsy. This segment also serves as an introduction to the professionals panel at the 2011 International Hemispherectomy Conference and Family Reunion sponsored by the Hemispherectomy Foundation and provides an excellent introduction to hemispherectomy surgery. Teressa Reidy, OT, Kennedy Krieger Institute, discussed intensive therapy approaches after hemispherectomy at the 2015 Hemispherectomy Conference and Family Reunion. The brain’s neurons, connections, and lobes don’t work in isolation. Functions and information are processed by many different areas of the brain that are connected by axons (“white matter”) and other structures that form circuits of information exchange. When these circuits are interrupted, whether by seizures or by epilepsy surgery, issues with attention, social cognition, and learning can occur. Understanding how your child’s brain circuits have been interrupted will help you advocate for their educational success, as well as help you understand their behaviors and challenges. Here, Dr. Lucina Uddin, neuroscientist, discusses brain circuits at the 2017 Pediatric Epilepsy Surgery Conference and Family Reunion. 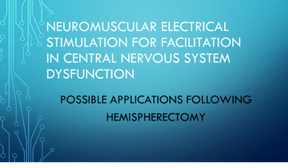 Lucinda Baker, Phd, presented this Power Point on possible applications of NMES for facilitation in central nervous system dysfunction following hemispherectomy at the 2014 Hemispherectomy Conference and Family Reunion. 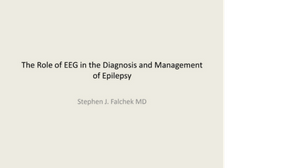 This presentation by Stephen J. Falchek MD addresses what an EEG is and how it is used in the diagnosis and management of Epilepsy. Joanna Couch presented on the topic of visual supports at the 2017 Pediatric Epilepsy Surgery Conference and Family Reunion. 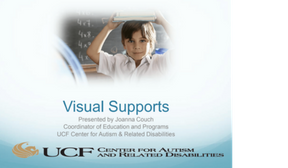 The presentation covers when, why, and how to use visual supports and some common mistakes made when using them. 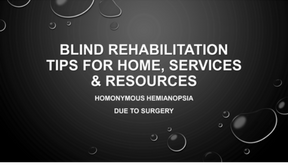 This presentation by Catherine Bacik given at the 2017 Pediatric Epilepsy Surgery Conference and Family Reunion provides tips that can be used in the rehabilitaion of a person with homonymous hemianospia due to surgery. Carrie Clark, a Speech-Language Pathologist, spoke on augmentative/alternative communication at the 2017 Pediatric Epilepsy Surgery Conference and Family Reunion. We have more videos on our YouTube Channel where you can also view by conference year or topic.